Are you looking for something do do on the upcoming sunny Bank Holiday? 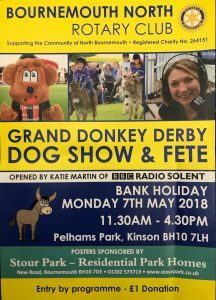 On Monday 7 May 2018, the annual Grand Donkey Derby, Dog Show and Fete is happening at Pelhams Park, Kinson BH10 7LH. This Annual May Day event is organised and run by Bournemouth North Rotary Club. It’s a great day out for people of the local area and raises thousands of pounds for local groups and charities. As usual the donkey races will be taking place in the main arena. They provide lots of fun and laughter, also entertaining live music is played by Poole Borough Band and is once again sponsored by Druitts Solicitors. Additionally bring along your dog and join the Staffie and Stray Rescue dog show. Get involved in some of the fun and more serious sections you may both win! It’s a great afternoon of entertainment and offers enjoyment for all. Gates open at 11:30am, Donkey Races and Dog Show starts at 12pm. See you there!